Storage boxes are fantastic for seasonal clothing, heirloom toys, large crafting supplies and anything that your child rarely uses. Some great recycled options for storage boxes? Wooden wine boxes, wooden crates, and shirt boxes. These all work especially well because you can stack them in the top of your child’s closet or on top of shelves hanging over a desk. Don’t have a filing cabinet? No problem! You can make an easy filing system out of cereal boxes. Simply cut the cereal boxes to fit on top of each other, secure with eco-friendly packing tape and cover with fun, graphic recycled paper. This is a great way to organize art pieces that your child is currently working on, homework and school projects and reports that are in progress. When it comes to children’s magazines, it can be hard to keep them all together, yet accessible at the same time. You can create an easy magazine holder using nothing more than a cereal box – again these can be customized with recycled paper to match any decor. These cereal box magazine holders look great lined up on a bookcase or on top of a desk shelving unit. When it comes to crafting supplies and miniature toys, organization is key. It isn’t much fun to do a craft project if all of your supplies are disorganized and hard to find. Instead of tossing all of your supplies into a large bin, use the plastic trays that many store bought cookies, crackers and pastas come in to organize these little treasures. These are the perfect size for sorting small objects, making them easy to see and use and they’re easy to stack on top of each other in a larger container. 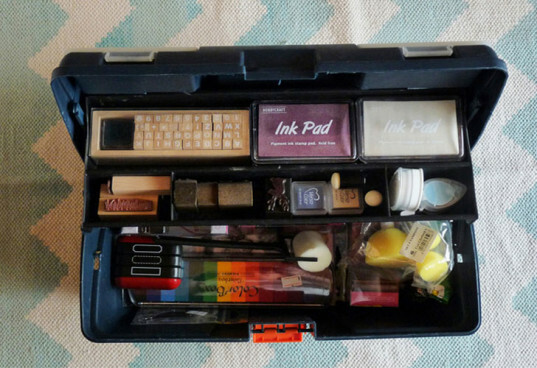 A great way to organize all of those arts and craft supplies is by using an old toolbox. Toolboxes are great because they have many different sized compartments and shelves, making it easy to locate and return items to the box. Also, since toolboxes are portable, they are perfect for the on the go artist or crafter – they would also be great for small books and toys. Most likely you already have an assortment of bins in your home that you can use to organize your children’s toys. Apply do-it-yourself toy bin tags to these bins to organize all of your child’s dolls, trucks, LEGO, games, and stuffed animals. Bins are great because they are easy for children to move around, tote from room to room and make clean up a breeze – just toss everything back in the bin. 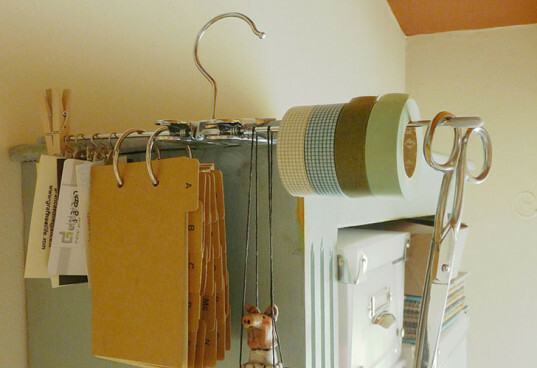 I love the idea of organizing tapes, scissors, wrapping paper and cards on a skirt hanger. This would be a great way to organize crafting supplies and then you could hang them on a wall next to your child’s desk. What eco-friendly ways have you used to organize your child’s bedroom? Storage boxes are fantastic for seasonal clothing, heirloom toys, large crafting supplies and anything that your child rarely uses. Some great recycled options for storage boxes? 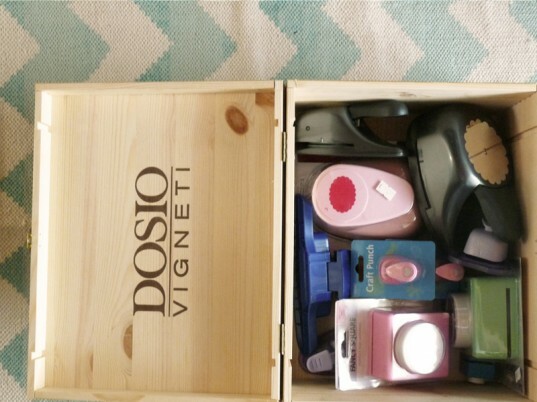 Wooden wine boxes, wooden crates, and shirt boxes. These all work especially well because you can stack them in the top of your child's closet or on top of shelves hanging over a desk. Don't have a filing cabinet? No problem! You can make an easy filing system out of cereal boxes. Simply cut the cereal boxes to fit on top of each other, secure with eco-friendly packing tape and cover with fun, graphic recycled paper. This is a great way to organize art pieces that your child is currently working on, homework and school projects and reports that are in progress. 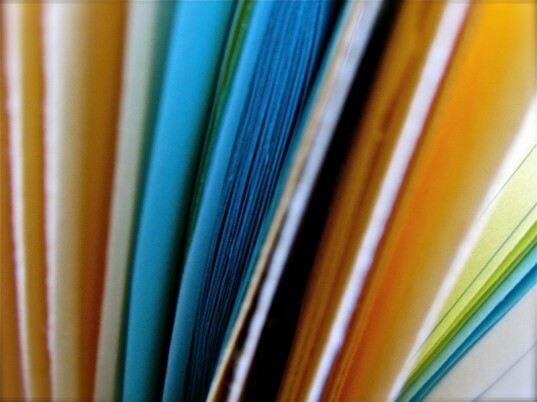 When it comes to children's magazines, it can be hard to keep them all together, yet accessible at the same time. 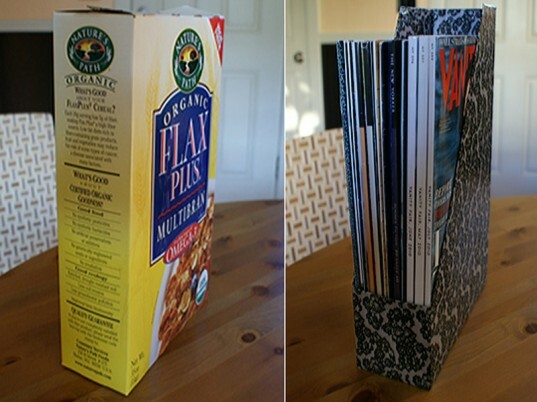 You can create an easy magazine holder using nothing more than a cereal box - again these can be customized with recycled paper to match any decor. These cereal box magazine holders look great lined up on a bookcase or on top of a desk shelving unit. When it comes to crafting supplies and miniature toys, organization is key. 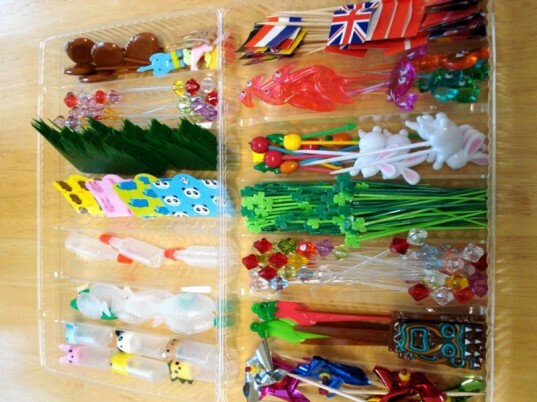 It isn't much fun to do a craft project if all of your supplies are disorganized and hard to find. Instead of tossing all of your supplies into a large bin, use the plastic trays that many store bought cookies, crackers and pastas come in to organize these little treasures. These are the perfect size for sorting small objects, making them easy to see and use and they're easy to stack on top of each other in a larger container. A great way to organize all of those arts and craft supplies is by using an old toolbox. Toolboxes are great because they have many different sized compartments and shelves, making it easy to locate and return items to the box. Also, since toolboxes are portable, they are perfect for the on the go artist or crafter - they would also be great for small books and toys. Most likely you already have an assortment of bins in your home that you can use to organize your children's toys. Apply do-it-yourself toy bin tags to these bins to organize all of your child's dolls, trucks, LEGO, games, and stuffed animals. Bins are great because they are easy for children to move around, tote from room to room and make clean up a breeze - just toss everything back in the bin. I love the idea of organizing tapes, scissors, wrapping paper and cards on a skirt hanger. This would be a great way to organize crafting supplies and then you could hang them on a wall next to your child's desk. What eco-friendly ways have you used to organize your child's bedroom?